A playoff series isn’t over when you are embarrassed in Game 1 on the road, as the Bulls were Saturday in Brooklyn in a 106-89 beating in which the Nets led by 25 points at halftime with already an astounding 40 inside points to eight for the Bulls. Not a lot of times. But the Bulls have; others certainly have. There was that 2007 Bulls conference semifinals against the Pistons when the Bulls were blown out Games 1 and 2 in Detroit and then made the Pistons sweat into a sixth game. More famously, there were the Lakers going into Boston to open the 1985 Finals and losing by 34 points and then winning Game 2 and the series. I know, Kareem, Magic and Worthy aren’t coming through that door or onto the bus or into the locker room. Which is just part of the problem the Bulls face in trying to turn around this first round series with Game 2 in Brooklyn Monday. The Bulls, surprisingly, got Joakim Noah back and he started Game 1 after there were questions about whether he’d even play in the series. Noah played about six minutes in each quarter and had four points and five rebounds. But he hardly was the same player with his painful plantar fasciitis and mostly moved haltingly. “It was disappointing; we did not play well at all,” said Noah. “We didn’t come out with the right mindset. They scored way too many points in the paint (led by Deron Williams with 22 and Brook Lopez with 21). We did not execute well offensively or defensively. We got smacked in the face. It’s on us to bounce back. There’s no time to feel sorry for ourselves. We’ve shown resilience all year. “I’ll be all right; I’ll be fine,” Noah said as he kept his foot squarely in an ice bucket. He said he decided Saturday morning to play, that his foot was improved, which I personally don’t believe much though have no proof, and insisted he felt better. But it is the conundrum that faces the Bulls now against a Nets team that is playing very well. Gerald Wallace was as active as he’s been all season with 14 points, Lopez was brutalizing the Bulls inside, Joe Johnson was finding open spaces like Ray Allen and making shots and former Bull C.J. Watson constantly took advantage of Nate Robinson with drives for 14 points. Though Robinson with 17 points, 11 in the fourth when the game was long decided, was hardly the only culprit. Wallace kept getting to the boards on the weak side beating Luol Deng. You know Wallace wants to drive from the left side and the Bulls kept giving him the angle. The Bulls know you push Lopez outside, but if he gets baseline he’s going to spin for a drop step. Never mind, he got those easily. He doesn’t react well in pick and roll, so the Bulls didn’t bother to put him in many. Box out Evans, who had 13 rebounds. It would have helped putting a body on him. Williams constantly got loose in transition, where he is most dangerous and can control the game. He even stripped the ball from Deng once and on a breakaway dunked backward. 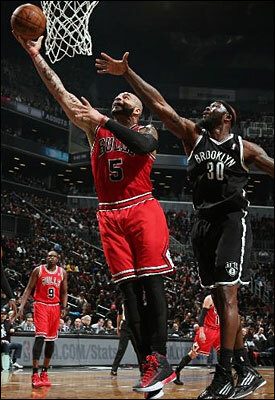 Yes, the Nets were mocking the Bulls as ham fisted Reggie Evans threw a lob pass for an Andray Blatche dunk. The Bulls may have played more poorly in the last few years. But rarely so out of touch with the basics of their game. You keep Watson on the perimeter, where he was wildly inconsistent against the Bulls this season. So the Bulls constantly let him get around the corner on drives without any help. Kirk Hinrich was struggling and suffered a late thigh injury. So the Bulls went to Robinson for scoring. But Watson then drove at him relentlessly. With Noah out of the game and Nazr Mohammed playing little, the Bulls were small and weak with the help and rim protection. It becomes an issue with Noah limited that has mostly been ignored or covered up the last few weeks as a playoff spot was basically assured. The Bulls have been giving up a lot of points and not playing particularly good defense without Noah and Taj Gibson, the latter with nine points and seven rebounds Saturday. The Bulls have masked it with some good scoring bursts, especially from Robinson. But it’s tougher in the playoffs. And the Nets did defend well, closing effectively on three point shooters and far more active than the Bulls, which usually is a Bulls’ edge. But with Noah limited in playing time and movement, the Bulls have been forced to go small more often with Boozer at center and Deng at power forward. That’s basically a poor interior defensive lineup since Boozer isn’t an active help defender and Deng could be overwhelmed by size. “I don’t think (our defense has been great lately with at least 50 percent shooting in seven of the last 14 games),” Deng agreed. “We’ve got to do a better job of shrinking the floor. I don’t know if that has anything to do with change in lineups (with players in and out with injuries). We can do a lot better job. Teams are shooting high percentages on us. So the Bulls had a plan that didn’t work, or, certainly, wasn’t much followed. The Nets finished shooting 55.8 percent and 42.9 percent on threes. They had 56 points in the paint, tied for fourth most the Bulls had given up all season with the others the dunk fests by the Rockets and Nuggets. So there’s one big plan to go, though it remains, as we know from the book of playoff clichés, still on the Nets to defend their home court. Series doesn’t start until the home team loses; only need to win one on the road to regain home court. Of course, there’s also backs to the wall and next step off a cliff. Time to pack it in. See if the Nets can make shots, especially Lopez. The Bulls’ defense has been so good because it is so active the way they can switch. They tend not to double team much, but they’ll have to more in the post. Make the Nets kick it out. Can Johnson beat you? Watson? Williams from outside? Tighten that interior shell, as Deng alluded. Perhaps not play a zone, but help inside and see if they can make all those shots. The Nets had a 12-3 edge on fast break points. The Nets had been a deliberate team much of the season. But since Williams got healthy and has played at a high level–and he was very good Saturday–they’ve pushed the ball more and scored into the 100’s. The Bulls are the ones who have to slow the pace. Get it into Boozer more, who has advantages in this series as the Nets’ interior guys don’t like to come out. Once he pops off the screen he’ll have that shot. It was going early, but the Bulls went away from it and began settling for jumpers falling behind 25-14 in the first as the other four starters other than Boozer were two of 11. The Bulls really cannot get into an offensive game with the Nets if only because the Nets have more talent. Williams playing like this is an All-Star. Lopez was one this season. Johnson has been one six times and as recently as last season. On the Bulls bench, Derrick Rose sat in a business suit for the second time this season (see earlier story on Bulls.com). It doesn’t seem like he’ll play this playoffs, though Thibodeau didn’t completely rule it out. Noah is limping through injury and hardly the All-Star and top defensive player he’s been. Deng is being pushed into more power forward work against bigger, stronger players. He shot three of 11 for six points. So the Bulls are asking a lot without Rose, which was expected, but also with a limited Noah. Perhaps Thibodeau goes back to Nazr Mohammed, who played just six minutes, but can throw some size in front of Lopez. Of course, if you’re in the playoffs looking for Mohammed to save you on defense and Robinson to bail out your shooting you may not be the team you believed you were. But that was Thibodeau’s post game message if not exactly in those words. The Bulls win this season not so much with talent but with team. They defend aggressively and regularly. They are there for one another, move the ball on offense and get easy shots. There was a lot of creating Saturday that produced nothing special with a poor 15 assists on 36 baskets, the third fewest all season. The Bulls showed up for the big dance with snow boots and an overcoat. “It was the end of the first and Brooklyn hit us with a haymaker and got us back on our heels,” said Thibodeau. “End of the first quarter, second quarter, it was poor defense and poor intensity; poor energy on offense. You can’t win like that. It was from A to Z. Defensive transition, middle penetration, poor paint protection, poor help, poor on the ball technique and lack of a multiple effort mentality. You name it. Thibodeau, as we know, demands ferocious effort, and there never was much. Worn out from the long, rough season with so many injuries? The start of the playoffs is not supposed to produce that, though no team played worse Saturday than the Bulls. It never was much of a game as Lopez, like the last game between the teams, got going fast and when Noah went out for Gibson the Bulls were small and Lopez took advantage. Neither Hinrich nor Jimmy Butler on switches could slow Williams. And other than an athletic tip in play by Gibson, the Bulls were pushed around early and trailed by 11 after one quarter with 30.4 percent shooting. It was obvious that Thibodeau began searching for offense with Hinrich, Deng and Butler not proving anything. The Bulls knew they’d have problems scoring. But they were counting on one of the perimeter guys getting going. None did. So Thibodeau naturally went to his energizer, Robinson. But Robinson can get distracted in matchups and duels, as he did with Watson, who blew by him for scores twice in a row as the Nets began to extend their lead. The Bulls know from playing with Watson he likes to push the ball in transition and go all the way to the rim. So no one cut him off as he was beating Robinson. Then with Robinson taking on the challenge, Boozer was being left out of the offense and the game was speeding up to a pace that didn’t make sense for the Bulls. “Everybody was excited for this game,” said the Nets’ Williams. “This has been a long time coming for this franchise, for this organization with the move and everything. We came out playing like we wanted to be here. I think we used the words locked in and I think we locked in today. From shootaround we focused on our plays and schemes. It all carried over to tonight and hopefully we can do the same thing the next night and not just our first playoff game. My legs feel good, my ankles feel good right now and I am excited to be back in the playoffs. Not necessarily if you were wearing red. After an early stint with Andray Blatche, the Nets came back with Lopez in a bigger lineup late in the second quarter and began to pull away with Lopez and Evans controlling Boozer and Deng as the Bulls had two rebounds all quarter while the Nets shot a blistering 80 percent, 16 of 20, in the quarter. Sing it, Dandy Don. The party’s over. They just started dancing in Brooklyn. Blatche scored 10 in the third with his lob dunk and then Williams highlight in your face. The Bulls Saturday were the punch line. We’ll see if they have enough to deliver a punch before they go home.